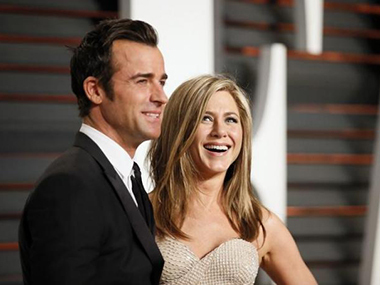 Former ‘Friends’ star Jennifer Aniston married long time boyfriend Justin Theroux at their Los Angeles area home after a four year romance, celebrity media reported on Friday. People magazine and Us Weekly, citing unidentified sources, said the couple exchanged vows in front of some 70 family members and friends at their Bel-Air home on Thursday. Representatives of the couple did not immediately return requests for comment. Celebrity news website TMZ.com posted photos of a stage, an outdoor dance floor, dining tables and a large cake being brought into the house Aniston and Theroux share in Bel-Air, a posh hilltop neighborhood of Los Angeles. Aniston, 46, whose first marriage to actor Brad Pitt ended in divorce 10 years ago, met actor and “Tropic Thunder” screenwriter Theroux, 43, in 2008 and the couple announced their engagement in 2012. People and Us Weekly said guests at the wedding included Aniston’s ‘Friends’ costar Lisa Kudrow and comedians Ellen DeGeneres and Chelsea Handler.